The Wet Cure Calculator will enable you to create your own artisan bacon, ham, pastrami and corned beef safely at home. Designed for the home cook who wishes to develop their own products using a domestic kitchen on a small scale and uses equipment and ingredients readily available to everyone. 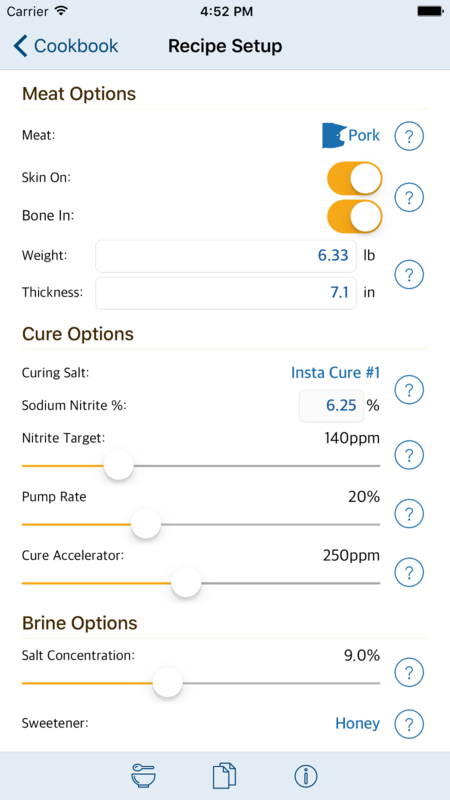 The app calculates the optimal ingredient quantities for the wet curing (also known as brining or pickling) as per your local food standards. It allows you to use a variety of meats such as Beef, Pork and Wild Boar & Game and optimises the recipe accordingly. The common cure methods: Immersion (%pickup), Equlibrium and Injection are supported. Supports Metric (kg, cm) as well as US Customary (lb, oz, inch) units. All aspects of the cure are customisable. Recipes can be used as templates for new recipes. Recipes can be scheduled with reminders. The Wet Cure Calculator can be downloaded from the Apple app store.